What is the most important thing about service? That you and your customers are completely satisfied. Bosch not only sets standards in the development of new power tools for trade and industry, but also in the organisation of services for all aspects of the power tool. This service ranges from an extensive offer of training courses through to optimum service in the event of a repair. Regular hands-on training is imparted to large power tool users and service center technicians by our central service personnel. The training includes both preventive maintenance and breakdown maintenance. Spare parts are stored at places close to the customers. The desired spare parts are delivered within the shortest possible time. Our service centers are geared to repair the tool in the shortest possible time. Nearly 90% of the repairs are completed within 48 hours. We guarantee that all our authorized service centers use only genuine Bosch spare parts. This will ensure 100% performance of the tool even after repair. Some of our service centers have been equipped with mobile service vehicles to give on-site repairs. This means your tool breakdown time is lessened to the extent of the tool travel time to service center and back. 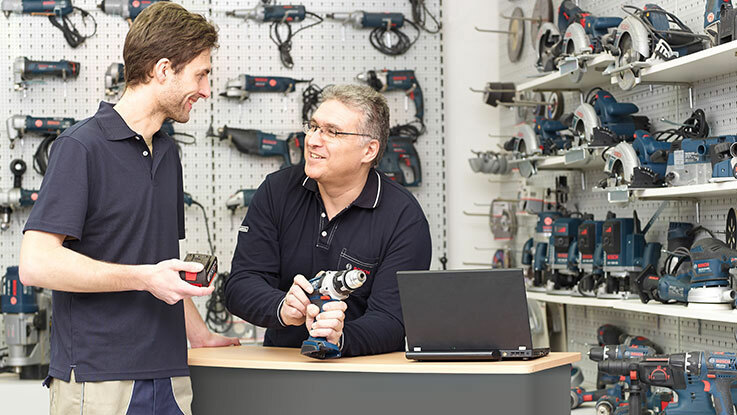 Competence close to you: A nearby specialist dealer will take care of repairing your tool for you.